More patients with chronic wounds that won’t heal unaided are seeking treatment in hospital and outpatient facilities. The prevalence of people with diabetes and pre-diabetes in the general population, higher rates of obesity, and aging baby boomers are fueling this demand, along with the rise of severe anemia, radiation tissue damage, burns, severe bacterial infection, and gangrene. Without proper care, these injuries can lead to further health problems or even amputation. In response, healthcare organizations have been adding wound care units to deliver specialized care. 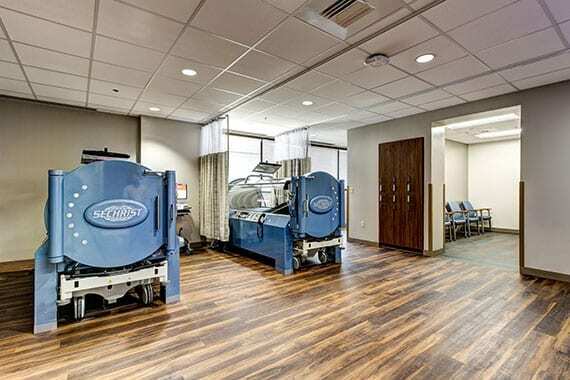 A wound care unit typically includes a waiting area, exam rooms, a dressing area with lockers for patient changing, a sub-waiting area for patients waiting treatment, and a chamber room where treatment is delivered. There’s also a consultation room for patient and family discussions with clinicians and bathrooms for patients and clinical staff. Support spaces needed include tech work and physician charting areas, soiled holding, and equipment storage.